5Dimes Promo Codes - Updated for the Middle of April, 2019! 5dimes Promo Codes – The Middle of April Updated! 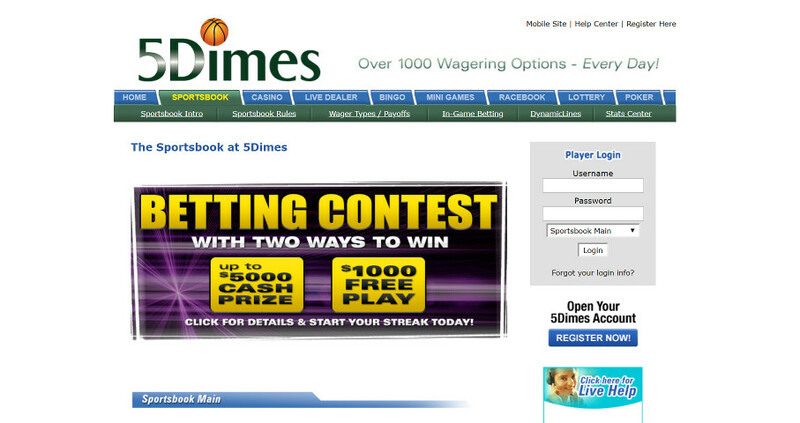 5dimes is a bit of an enigma in the online sports betting world. They maintain a website that looks like it was built in the early 1990s (seriously check it out). 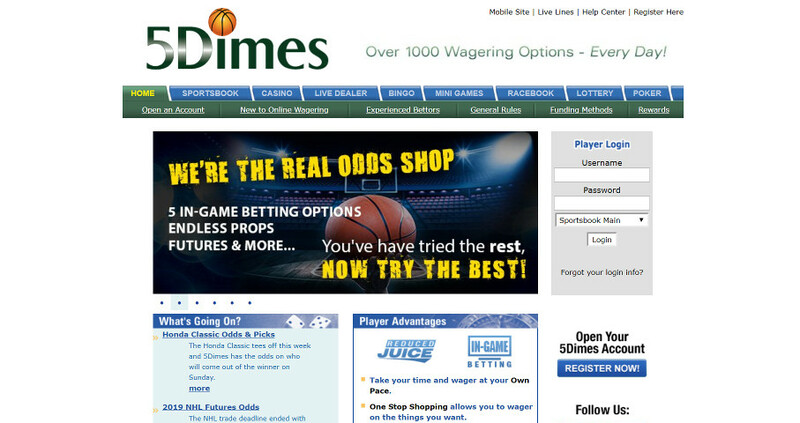 The 5dimes logo has a moving basketball bouncing up as the dot on the “i”. This is seriously right out of the first or second iteration of the internet. Do not let this fool you. Underneath it all, 5dimes is an excellent sportsbook. 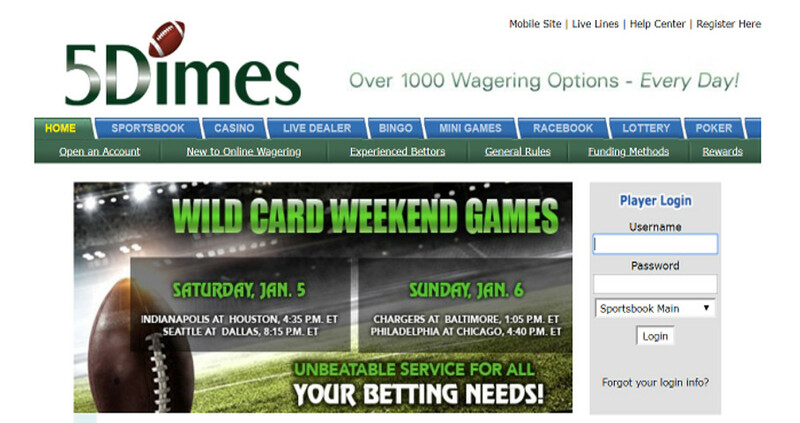 While they have a truly lackluster website, the actual betting at 5dimes is hard to beat. One thing new bettors should keep in mind… if you accept a bonus other than reduced juice option, then the reduced juice option is removed from your account. It’s lower juice or any of the different bonuses listed below and the reduced juice is, in general, the best option at 5dimes. The choice is yours but you can’t have reduced juice AND a deposit bonus or free bet. Know that going in and you are good to go! New players can take advantage of a 50% free play reward up to $520 depending on how much deposit. You must contact customer service within 24 hours of making your first deposit and request your bonus. You will not be eligible for any reduced juice wagers. If you choose this reward then all others are removed from your account. Earn yourself 77 One-Dollar Shots at the world’s largest Pick 3 and Pick 4 Payouts. This is for the new players here. Deposit exactly $77 processed through either a credit card or crypto with an eWallet to have the promotion applied. Busto? No worries at 5dimes. They give you a 20% reload bonus up to $500. There are a few catches with this bonus and they depend on which deposit method you use to fund your account. Deposits from $100-$249 have a fixed free play amount of $40. If you choose a lower than 20% cash back reward once per year, you are not allowed to qualify for the higher percentage rebate. Or get a 7% rebate any other day. Play in this fixed limit Omaha Hi/Lo tournament for a chance at your share of $500 guaranteed. There is no fee or buy in, play for FREE! Registration will begin five days prior, and is capped at 2000 total entrants. It’s hard not to like 5dimes. If you have ever gambled online you have almost for sure heard of them. They keep things simple on their website. But you know what, it works and it has worked smoothly for years. Don’t fix what isn’t broker, right? As far as bonuses go… stick with the reduced juice if you make any significant quantity of bets over the year. You can pay less in vig and that adds up to a positive, no rollover required bonus for you. If you do take one of the other bonuses they offer then you give up this option. That’s the one negative I’ll stick them with. It would be really nice to get a deposit bonus AND reduced juice… a boy can dream, right?